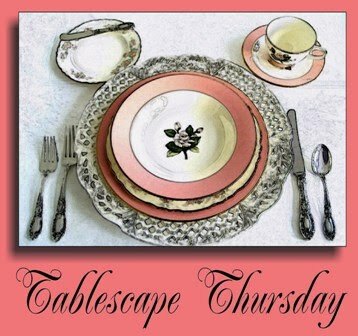 Welcome to the 109th Tablescape Thursday! Happy Tablescape Thursday! Come on out on the porch…it’s a beautiful day! We don’t have breezes today so we’ll just turn on the fans and make our own breezes. The weather is positively perfect…not too hot and not too cold…just right for dining on the porch. I have beautiful new china to share with you today…it just called for a special centerpiece of pretty flowers. I found some pretty Alstroemeria at the super market and filled in with a sedum that’s currently blooming in my garden. It’s called, ‘Autumn Joy‘ and the flower heads go from rosy pink to a lovely russet as fall arrives. By the way, this photo really surprised me. The background came out sooo white, which really showed off the brilliant colors in the flowers. You’d think I dialed up the contrast for this shot, but I didn’t. For this tablesetting, I layered vintage cutwork linen napkins inside fluffy organza sheaths. They reminded me of beautiful, frilly petticoats…remember those? Wow, I have never seen this Mikasa pattern, and I love to lurk in china departments! It's really stunning. I think the organza over the napkins is reminiscent of delicate butterfly wings — lovely touch! And, yes, I am old enough to remember petticoats! Love your tablescape. The candlelight is just stunning. Love that flower pic too with all of the contrast. Very pretty! The butterfly plates are so pretty. Dinner by candlelight is always so much prettier than by regular light. I think my favorite part about that china is the variety of colors in it. There are so many ways you could go. Now, the way that YOU chose to go was beautiful,and those napkins did look like crinolines. I thought that table was pretty in the daylight, but with the candles? LOVED it. Gorgeous as always, Susan! 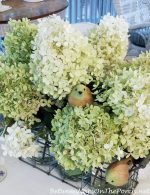 I love the way you combined purchased flowers with seasonal ones from your garden — perfect! The ant is hilarious … I've brought "critters" in SO many times … hitching a ride on flowers from the garden! Your pictures by candlelight are pure magic! You're our inspiration and always will be. Hail to the Queen of Tablescape Thursdays! Crinolines we called them! I remember my older sisters starching them and drying them over an umbrella so they would stay full! My Autumn Joy are covered with bees, I am scared to death of them!!! You were brave! Beautiful table, Susan, Thank you! Beautiful! I especially love the candlelight. your bouquet is so pretty too. A beautifully set table, as usual Susan! Thanks for hosting! This is really a pretty table, and the little ants were only noticed by you! The candle light is always so pretty and the flower arrangement sweet for a early fall evening! Ditto to Debbie's comment about the variety of colors giving so many ways to set a table with this beautiful pattern. Perfect discription for the petticoats napkins. I suspect these don't itch like some of my crinolines did! What an incredible idea for the napkins, I just love the organza! The new dishes are most beautiful as well! I like the name "Modern Butterfly" just as much as I do the pattern, very pretty! Your centerpiece is gorgeous and you are right, what a nice contrast with the white background! The pillar candle holders from Marshalls are perfect with your 'scape. As always, thanks for hosting TT! The butterfly china pattern is so pretty and so perfect for your table setting. Those flowers are lovely, too and worth the ant chase! Such a beautiful table setting on your porch. My TT post is on my porch as well. Being in N FL I can enjoy it for a while longer. Looked at Mikasa…loved the Tuscan Countryside … love your tablescape! Gorgeous! So…so…pretty! Everything is so warm with the candle light sparkling and reflecting off from the glass ware and silver. I love the freshness of this mostly white table. It makes those flowers and pretty dishes really stand out, and it also makes for such a pretty rosy glow in candlelight! The crystal is really beautiful too! It's been a while since I have participated in Tablescape Thursday. It's fun to be back! Your table is lovely — especially by candleglow. Love your new dishes. I like your beautiful new butterfly dishes! I still want those chargers!! G'eve Susan ~ This is the most romantic, elegant table scape I've seen in a good while. The details you have touched this table with are fabulous. How lovely the porch looks this time of the year! I know your enjoying it so. The Pattern of the dishes is wonderful. The table is so pretty even with a few ants. Love the stemware and napkin. The bouquet is beautiful! Your vintage table linen is beautiful!! Your tablescape looks lovely !! I really liked the Mikasa butterfly dishes, they are so pretty. When I looked at the Mikasa web site I found the dishes I have been looking for, they are perfect, the Brava Rooster pattern. I just love your tablescapes, they are candy for my eyes. Such beautiful dishes..your table is lovely..
Hello Susan… its impressivly beautiful, specially when you lit up the candles… what a novelty in it… Yes china are great, love them specially because of their variety in colours, so you can go for any combination… And your idea to table napkins were really great and it gives the napikns a very delicate touch… Very lovely over all. yes, you made another great table with this colorful Mikasa set. Just wonderful. I can understand the ant completely that it want to enjoy this nice tablescape! Wish I coud be on its place. Not literally, but at least on a chair! I am so sorry, that I have not the time to visit all the participants, I always have enjoyed that. But maybe next week I will make a contribution to TT. Wish you a very nice weekend! Absolutely everything is gorgeous! What a wonderful sense of style you have! 109th tablescape?? Wow! That's a lot of dishes!! (just kidding) Always love to see what you create… gorgeous as always! Elegant and beautiful, ants and all. The entire room is breathtaking! Love your new dishes, on my, they are just beautiful!! Such unusual china – I love that it has an arty feel to it. I am laughing about your ants, but it's a sign that your flowers are fresh from the garden, so not all bad! The whole table is so pretty!! Remember that old Carly Simon song, "Nobody does it Better", well that's your tablescapes. Always stunning and unusual. Recently some ladies at my church chased a green lizard among the pews. One of them threw a songbook at him. He had hitchhiked in among the ferns. Connie…that is too funny! Better ants than lizards! LOL I hope he got away! Susan,My tribute to em' "Dawgs"(your fav team) was fun.If you have time to visit LazyonLoblolly check it out,nothing fancy! Oh Susan, I ALWAYS find an ant or two on the Sedum I cut and bring in the house — now when I cut it I put it upside down in water before bringing it in. Sometimes there's still a brave little ant soul clinging to the flowers! Gorgeous tablescape — LOVE the butterfly china. A charming mix, your table, of sophisticated colors and shapes, and just good ol' PRETTY! 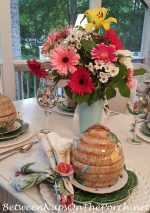 Your very happy dishes lend themselves to many different tablescapes on the porch! Such a pretty tablescape Susan! the fresh flowers are incredible! I know exactly what you mean about the little friends that come along with them. I had made a bouquet from some flowers in my yard once that had tiny white spiders in them… Then for several years I kept finding them in my house!! Roses are famous for earwigs around here too! Probably why I use dried and silks more often these day, lol! Hi Susan, I went to MIkasa and I think my new love is the Modern Butterfly! I really like the colors, they are so brilliant and I am starting to lean toward primary colors in my kitchen. I would love to win! Your table looks so pretty as usual! So many great colors in that gorgeous china. As always your table is beautiful…I love the candlelit photos…it's magical. Susan, Thanks for giving your readers a chance to have a set of these wonderful dishes. I,too, would also love to win my 1st giveaway! My favorite is Antique Orchard, but I think the Modern Butterfly is so fun and you have shared great ideas for us to consider. Love the whimsy! I have posted at the Mikasa website and requested to be on their mailing list too! Dont have time to twitter tho: Facebook, reading blogs and a job are enough for me! Table is beautiful! 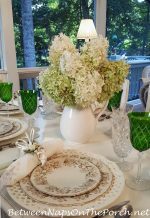 I am new to this and came across your blog looking a tablescape photos My favorite is Love Story but I do also like Modern Butterfly! Thanks for sharing your wonderful table ideas! Love it!